A friend of mine recently spoke to me about upgrading her engagement ring for her ten year wedding anniversary. 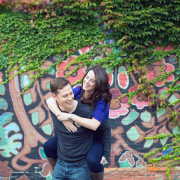 She and her husband had married quite young and didn’t have the money to spend on an expensive ring, so they ended up using an engagement ring passed on from his family. While she loves and cherishes the ring and the sentimental story behind it, she longs for something that would be just for her. She is far from alone. Upgrading or redesigning engagement and wedding rings has become a huge trend in the jewelry industry. These ring upgrades are usually done for an anniversary between the 10 and 15 year mark. People have many different reasons for wanting to change their ring. Some, like my friend, find themselves in a new financial situation from when they first got engaged. Others didn’t really like the style of the ring they were given. Some just want a ring which is a more current design, or more reflective of their personal style. Upgrading your engagement ring is not for everyone though. Many people are very emotionally invested in their ring and could never imagine changing it. Some people find it tacky to want a larger diamond than the one they were given. I however think that as long as the decision to upgrade is ok with both people in the marriage, and there are no hurt feelings from the one who gave the ring, then people should go ahead and get their dream ring. 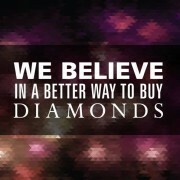 There are many options for upgrading, starting with the diamonds. The center stone can be changed to a larger or better quality diamond, or side stones can be added to create a three stone ring. For extra sparkle, pave diamonds on the metal band can create a more modern look for the ring. However if a much larger center stone is being added the setting will have to be altered to fit the new stone. Many people want to put their original diamonds into a new style of setting. The halo style of setting is an extremely popular choice and will make the center stone look much bigger. Some people choose to change their yellow gold rings to either platinum or white gold which is a more contemporary look. Unfortunately if the original diamonds have some yellow in them, setting them in a white metal will only bring the yellow out more and is not recommended. For those who don’t want to change the original ring there is always the option of getting a new style of wedding band, or adding a third ring to the wedding set as an anniversary ring. Stacking multiple rings on one finger is an extremely popular option these days. Upgrading your engagement ring doesn’t have to mean getting rid of the old stones or jewellery. A coloured gemstone could be set into the old setting and worn as a right hand ring. The original diamond could be made into a pendant or earrings, or held onto to give to your children once they reach a certain age. While there will always be those who passionately love their original engagement ring and would never want to change it, there are many people who love the idea of upgrading their ring. 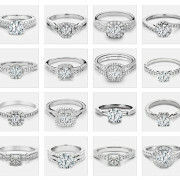 Are you interested in upgrading your engagement ring? We here at Kimberfire would love to help you create the ring you’ve always dreamt of!